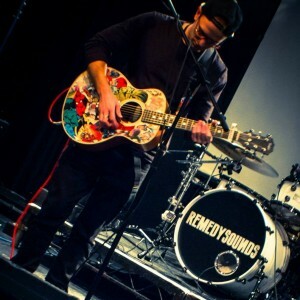 Remedysounds is an award-winning loop pedal artist renowned for his raw vocal talent, skilful guitar playing and beat-boxing. After playing over 300 shows in 2013, and his completely unique live on-stage set-up and captivating live sets have won him a large online following of dedicated fans. 2013 saw the release of Remedysounds’ debut single ‘I’ll Give You What You Need’, which expresses the artist’s views on the current state of the music industry. The track hit No.5 of the iTunes singer-songwriter chart on the first day of release. ‘I’ll Give You What You Need’ was quickly followed up by a second single ‘Jayden’s Song’ – a track written by Remedysounds to raise vital funds needed to pay for treatment for his very ill son Jayden. The single was a vast contrast to ‘I’ll Give You What I Need’, yet still hit No.10 of the iTunes singer-songwriter chart, showing Remedysounds’ versatility and popularity as a whole. The single has had huge critical acclaim, leading to Remedysounds headlining his own UK independent tour. 90 Route de Morzine, Montriond Ardents bus stop outside, free parking across the road.